My goodness, this has been one busy/exciting week already, with three terrific new dogs in a row. This morning we assessed Cody. Boy did this handsome devil have a fantastic time here! 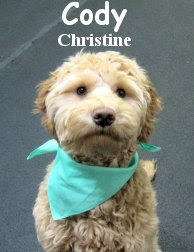 He is a six month old, twenty pound, apricot colored, Australian Labradoodle, just like Abby we assessed yesterday... What are the odds of that lol? Now, youngin' Cody hung-out in the Medium Roll and wholeheartedly enjoyed himself. He wasted no time, going straight to play with a number of dogs. His energy level and spirits were high, fast and furious play was his game. There isn't any doubt that Cody and his owners will benefit greatly from dog daycare. We are pleased that this little fella has been socialized early and look forward to taking care of him again. Well done Cody! Here is a shot of Cody in action with the ever-so-hard-playing Tikvah! A whole load of news! Behind the scenes at Fort Fido!